With another year behind us, we’d like to know what you liked best on the blog in 2016 and what you’d most like to see in the new year. Let us know in the comments! Should You Only “Edit What You Know?” by Sue Archer. Should we only take on projects that are squarely in our comfort zones? How to Become an Editor, by Rosemary Shipton. Years ago, we all became editors through a kind of apprentice system. Perilous Punctuation: The Email Salutation, by Frances Peck. How to punctuate an email salutation is a nicety that only grammar geeks would fret over. But fret we do. Wasted Words: Recasting Punctuation, by Wilf Popoff. Clever people are fretting that texters no longer talk to each other. Nonsense, say others. Zoom, Zoom: Rev Up Your Editing, by Paul Cipywnyk. How quickly can you edit and still do a good job? Twitter for Wordies, by Lori Burwash. Make the most of your Twitter time by following these tips. Writing Wrongs in Fiction, by Melva McLean. In a historical piece, there’s always a tradeoff between what’s real and what’s true. The Ongoing Demise of English, by James Harbeck. Stern voices over the centuries have taught us that English just isn’t spoken as well as it used to be…and it never has been. Editing Niches: Back to School With Thesis Editing, by Cathy McPhalen. Do you include thesis editing in your repertoire? The Inner Editor: Introvert, Know Thyself, by Virginia Durksen. Introverts are far more varied than the handy label implies. 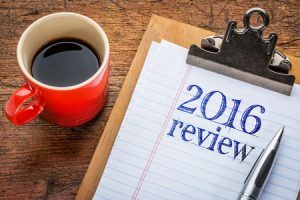 6 Responses to "Year in Review: The Best of 2016"
Happy new year, Anna Williams. Thanks for sharing that list of 2016 blog posts. Even though I don’t always comment on the articles, I always read them. Every time. For me, the highlight of the year was your patient, thoughtful editing. I especially love that you know exactly where to push back and cut the words I didn’t need in the first place. It’s wonderful being edited by someone who knows how to edit just the right amount. I’m flattered, Virginia! Thank you for being both a contributor and loyal reader. Happy new year to you, too! Another wonderful year, Anna. Bravo, bravo. Since I gave quite a few of the contributors’ names to you so you could “solicit,” it would be conflict of interest to name a favorite. The diversity of the entries makes this a remarkable blog. And thanks so much for your invaluable recommendations! Hi, Anna, and thank you so much for sharing this list of all the 2016 blog posts. It’s wonderful to see the variety of posts and to witness the depth and breadth of experience, knowledge, and wisdom that they represent.